Formed as the 1st Light Brigade in October 1937, the Brigade was re-designated the 1st Light Division during the spring of 1938. The division received 114 Czech Pzkpfw 35 tanks in April 1939 (the only German division to be equipped with this tank) and in July the same year, discarded it's compliment of Pzkpfw I tanks and some of it's Pzkpfw IIs. The 1st Light was the strongest German division during the campaign in Poland in September 1939, being equipped with 221 tanks, of which 148 were armed with guns of 37mm or 75mm calibre. The division was re-designated the 6th Panzer Division shortly after the Polish campaign. During the French campaign of 1940, the division formed the spearhead of the German thrust across the Meuse, reaching Cassel near the Channel coast in just nine days. The second phase of the campaign in France saw the division being attached to Guderian's Panzergruppe and fighting it's way south-east to Epinal, taking the fortifications there by 21st June. The French campaign ended four days later. Following the campaign in France, the division was again reorganised. The three battalions of the 4th Cavalry Rifle Regiment were organised into two 2-battalion rifle regiments, with two rifle battalions being transfered from the 16th Infantry Division. Only one company was equipped with the Sdkfz 251 half-track, the remainder rode in Krupp Protze light trucks. The 41st Tank Destroyer Battalion received 15 of the new 50mm calibre Pak-38 anti-tank guns. Prior to Operation Barbarossa, the German invasion of the Soviet Union on 22nd June 1941, the training and the morale of the division was high. 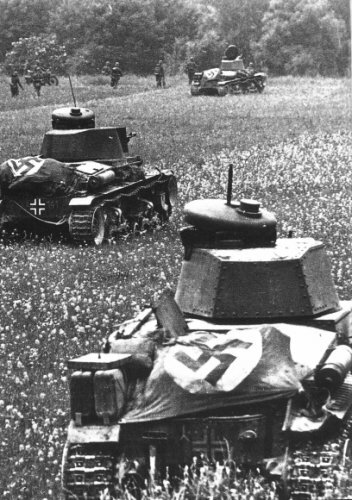 The 6th Panzer Division was attached to 41st Army Korps, 4th Panzergruppe, Army Group North at the start of the invasion and formed part of the spearhead that thrust towards Leningrad. The division reached the Luga River, the gateway to Leningrad, in just three weeks - a journey of some 500 miles (800 kilometres). The division was taken out of the line after breaching the Leningrad Line in September and ordered to join the attack on Moscow. The division took part in the offensive against Moscow at the beginning of October 1941, as part of 3rd Panzergruppe, Army Group Centre. The attack bogged down in the autumn rains after crossing the Dniepr River, then resumed in mid-November once the frosts set in. Unfortunately, the few remaining Pzkpfw 35 tanks failed in the frosty conditions due to their pneumatic controls. As the winter conditions worsened, the division fought as the rearguard for 3rd Panzergruppe against the Soviet counter-offensive. The last Pzkpfw 35 tank of the division broke down on 10 December near Klin, after which time, the division fought as infantry until re-equipped the following summer. In April 1942, the division was withdrawn from the front for rest and refit in France, where it stayed until mid-November 1942. 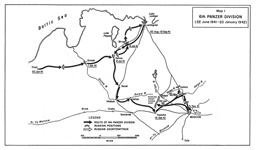 The division formed the spearhead of Manstein's relief attempt against the encircled 6th Army at Stalingrad, but the break-out attempt by the 6th Army never materialised, despite the 6th Panzer Division approaching to within 29 miles of the city towards the end of December 1942. 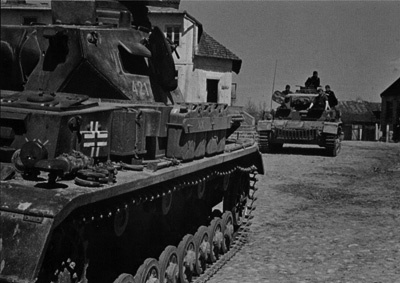 The division was then involved in the mobile defensive battles between the Don and Donets until spring 1943, after which time it was involved in a counter-attack towards Kharkov, which was once again taken by the Germans in March 1943. With one panzer battalion withdrawn for refitting with the new Panther tank, the next three months were quiet during the build-up to Operation Citadel in July 1943. The summer offensive against the Kursk salient saw the division fighting with the southern pincer as part of 3rd Panzer Korps, Army Group Kempf. 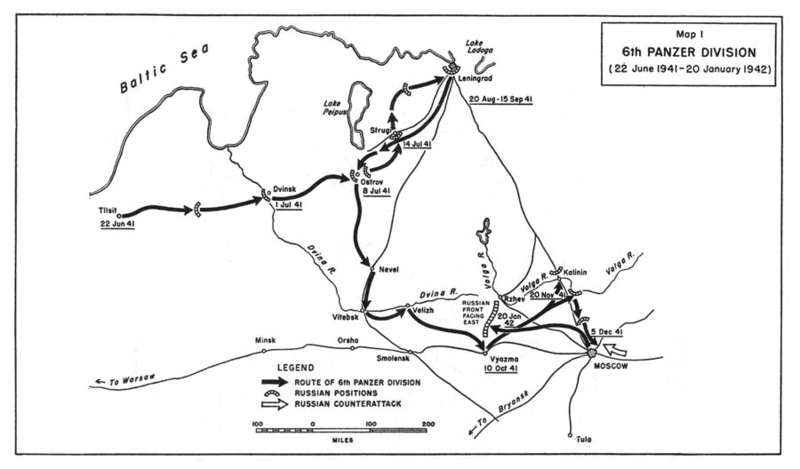 Fighting defensive battles around Kharkov from the end of July 1943, the division was involved in the failed attempt to prevent Soviet forces from crossing the Dniepr River. The division was involved in breaking through to the 1st Panzer Army in the Korsun Pocket in January 1944. The division was then encircled in the Kamenets-Podolsk pocket in March 1944, but the breakout was successful in early April. Involved in the defensive battles in Galicia, the division was withdrawn to Germany in May 1944 for reorganisation and rebuilding. Sent to the Narew River in northern Poland as a reserve in August 1944, the division was soon involved in mobile defensive fighting until November 1944, after which time it was again withdrawn from the front. The final episode of the 6th Panzer Division began in early December 1944 when it was transported to Hungary, north of Lake Balaton, with the aim of preventing Soviet forces from capturing Budapest. The Soviets managed to encircle the city by the end of 1944 and despite repeated attempts at breaking through, the division's final attack of the war was north of Lake Verence. Falling back to the Austrian border by mid-March 1945, the division was tasked with defending Vienna and guarding the last bridge across the Danube - essential for the German divisions retreating out of Hungary. Vienna was given up in early April and the division withdrew north of Brünn, surrendering to the Americans in early May 1945. The Americans handed over most captured members of the 6th Panzer Division to the Russians.